Just imagine for a moment that you had the power to step into the offices of one of the largest tech companies on the planet and start calling the shots. Deciding what wearables should be built next, what they should be able to do and generally identifying where things need to get better. Well that's exactly what we thought we'd do. Sadly Tim Cook hasn't given us free reign to shape the next Apple Watch, but as a team we've come up with what we consider the ideal blueprints for those companies and where their wearable tech ambitions should lie. So what would we do if we were trusted with making those big decisions that could shape the future for some of the biggest companies in wearable tech? Read on to find out. Do you agree/disagree? Let us know in the comments section below. Apple is sitting pretty in the wearable world right now. The Apple Watch is one of the most popular and well-rounded wearables out there; it's got a solid ecosystem, its health and fitness initiatives are growing and it's taking steps to become a standalone device with features like Apple Pay and LTE. So what could Apple do to further its impending dominance in the world of wearables? First, it should take a page from its iPod and iPhone playbook and open up the Apple Watch to those of us with Android phones. Apple would likely have to engineer its way out of certain problems, like using Siri, Apple News and Apple Music without leaning on an iPhone, but it's not impossible and the benefits are clear to see for everyone involved. Apple has been slowly making inroads in the health sector, partnering up with Stanford University on a study for atrial fibrillation and being in the FDA's pilot program for fast-tracking health innovations. In the meantime, it should focus its efforts on overhauling its wellness program. The Apple Watch needs to be able to auto track workouts. If you go out for a walk, it needs to recognise it and log it. If you are out on a run, it needs to log that, too. It needs to make using it as a fitness tool as seamless as possible. It can then combine auto tracked workouts with new reminders and alerts. If the Apple Watch figures out that you walk every morning, and then you stop, perhaps it could start to nag you a little that you need to make up for that lost activity in some way. Maybe it could even recommend alternative activities that would result in the same amount of calories burned. Be smarter, basically. Apple should also think more about mental health. It's not enough to tell you to take a breather for a couple of minutes (though it can certainly help). How about telling you you're spending too much time doing things that aren't good for you – like checking too many social media apps? What if the Apple Watch could actually help wean you off your phone? When it comes to software design, features and hardware, Apple is jogging at a brisk pace. Where it needs to improve is in intelligence, and how you can actually use its wearables to make your life better. If we had to score Garmin's 2017 out of 10, we'd probably give it a solid 8. After all, it gave us the best hybrid smartwatch with the Vivomove HR and sports watch with the Forerunner 935. We also got its best smartwatch effort in the shape of the Vivoactive 3, which brought with it contactless payments, a feature that makes a whole lot of sense on a sporty wearable. At the beginning of 2018 we also got a feature that many had been hoping for some time, and that was a built-in music player. 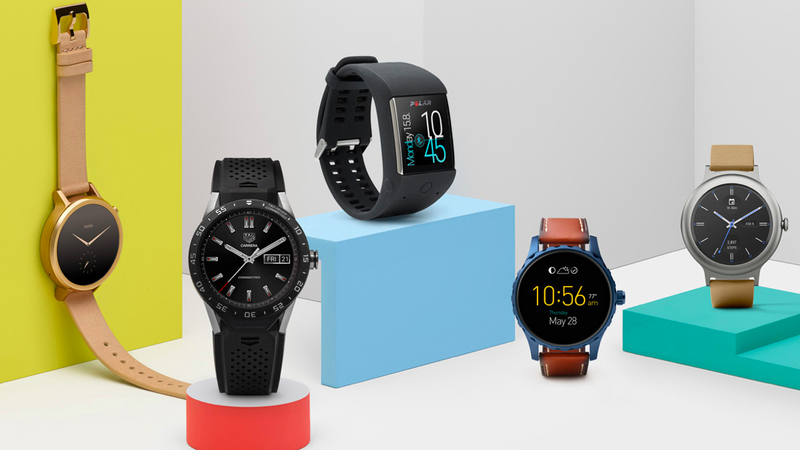 Garmin is finally playing with the big smartwatch names, but what we'd really like to see happen next is for those features like payment support to start filtering into watches like the Fenix series and the top end Forerunner watches. The reason this hasn't happened just yet is likely down to space and battery. One of the reasons the Fenix and Forerunners are loved are because of the mammoth GPS battery life performances. No doubt adding features like music and payments would impact on that. But hopefully this is something Garmin is working on. We've also already waded in on something else we'd like to see get addressed and that's the Connect IQ app store. It's time for the storefront to get spruced up and as its smartwatch efforts improve, more people are going to be spending time in what is currently quite a clunky looking place. Look, we know we sound like a broken record, but we'll repeat it one last time: Google needs to make a Pixel watch in 2018. If we were given the podium at Google HQ tomorrow, it's the first thing we'd say, and we'd keep repeating it as security dragged us out of the building. That's not because there aren't already plenty of nice looking Android Wear smartwatches out there – there are loads – but because it needs a flagship to better showcase what Android Wear can do. Fashion brands like Fossil are very much leading the charge, as tech companies have stepped back, but from Google's side it feels a bit rudderless at the moment. Android Wear 2.0 was delayed for quite a long time, which is why we weren't surprised that Google didn't roll out another big update in 2017, but this year it's time to up the game. It's currently pushing out the Oreo update, which brings a few tweaks, but we hope Google has something bigger up its sleeve for 2018. Another thing we'd like to see, which applies less to Google and more to its partners, is more different ideas for Android Wear. From a design perspective Android Wear has never enjoyed more diversity, but functionally there's a lot of similarity. We want to see smartwatch makers putting their own touches on Android Wear beyond a few watch faces. More things like the Misfit Vapor's touch-sensitive bezel or even Diesel's Dial Effects. Wasn't Android's ad campaign 'Be together, not the same'? In sum, Google needs to reassure us that Android Wear is still a priority, and what better way than by making a smartwatch it can truly call its own? And one that can knock the LG Watch Sport from the top of our Android Wear ranking. Because let's be honest, it's already looking a bit long in the tooth. Fitbit is in a weird place. After taking an early lead in wearable tech and rising to a place where its name became almost synonymous with fitness tracking, it's started feeling the burn of strengthened rivals. The company bet big on the Ionic, its first smartwatch, but there's been concern that it isn't selling too hot. In 2018 we'd like to see Fitbit's interest in further health opportunities materialise into products. This is what is going to help it stay ahead of the competition and give people worthy reasons to upgrade their trackers. Fitbit promised that sleep apnea detection will come to the Ionic, but that still hasn't happened, while CEO James Park has also talked about monitoring hypertension and arrhythmia, which could be huge if it can beat Apple to the punch. The company is also moving in on diabetes, and we'd like to see it continue to do more in glucose management this year. Fitbit confirmed it's moved strictly to a spring/autumn release schedule, so we expect to see something in the next few months. A Blaze 2 watch that supported Fitbit's new app ecosystem – while being cheaper than the Ionic – would be welcomed. And we hope that the Fitbit Charge 3, also expected this year, will adopt the new SpO2 sensors of the Ionic. Oh yeah, and Fitbit Pay should be on all future trackers and smartwatches. No excuses. Samsung does a bit of everything. It does wrist wearables with the likes of the Gear S3, Gear Sport, and Fit2 Pro; it does VR with the Samsung Odyssey and Gear VR; and it even does 360-degree cameras. Samsung is a massive organisation, and its tentacles reach everywhere. That's why the number one thing Samsung needs to work at is improving how all of its devices and services work together. This is an area the company knows it needs to improve on, recently announcing that its SmartThings platform would have an app for wearable devices. That way you can control your home products right from your wrist. But more needs to be done. Bixby still isn't available on Samsung's Gear smartwatches, which is crazy when you consider that Bixby has made it over to refrigerators and AKG headphones. That's right, you can use Bixby on your refrigerator but not your wrist. Samsung, like Apple, is in a position where it can link together many of its devices together into a larger ecosystem. Unlike Apple, it hasn't really mastered this yet. The next thing Samsung needs to do is to improve its existing fitness capabilities. Samsung has an upper hand on Apple in that it already auto-tracks your activities, but the actual tracking – we've found – has been a little subpar. It needs to work on that. Finally, Samsung needs to find some fashion sense. The Gear S3 and Gear Sport aren't ugly watches, but the lack of sizes and styles limit their appeal. We want more variation: the Samsung Gear S4 smartwatch should come variety of sizes, colours and materials. Samsung is in a good spot. It does a little bit of everything, it experiments, and on the whole it makes good products. In 2018 it needs to bring everything together into one big Samsung ecosystem – and try and get its Gear on more wrists. Xiaomi's another tricky one. The Chinese powerhouse, and its close partner Huami, already make just about every kind of tech you could imagine alongside the bestselling super cheap Mi Bands. Make a kids wearable? It's done that with the Mi Bunny. Branch out into women-focused smart jewellery? Check – thanks to the Amazfit Moon Beam. If we had to pick a new category for Xiaomi to move into, we'd say hearables – it's pushing Monster in-ears on its international site at the moment. But why not look ahead and build a budget pair of smart earbuds to pair with the Amazfit Pace, getting in early while the AirPods are still limited in features and quite expensive? If there's one piece of advice we'd give Xiaomi, though, it's to revamp its software, which still really lags behind the more premium fitness tracker offerings. In the third quarter of 2017, Xiaomi was the biggest selling wearable tech manufacturer in the world, outselling Fitbit and Apple. That's millions more people with Mi Bands on their wrist – the opportunity is there to really help motivate and analyse their lifestyles and fitness levels. Because otherwise, what's the point of selling millions of activity trackers?